Well hello! It has been a while since I last blogged, and that is because I’ve been a very busy fatty! I am currently in New Zealand (sitting at an internet kiosk in the ferry terminal in Wellington in the North Island, about to catch the ferry to Picton in the South Island) and over the past two days, I have been attending the Massey University, Palmerston North Fat Studies Conference – Reflective Intersections. I will go on to blog about the conference later, and talk in more detail about some of the presenters and thoughts I have, but today I want to share MY paper with you all. But before I do, I want to thank Dr Cat Pausé – an amazing academic and activist, and someone I am proud to call my friend – for her INCREDIBLE work on this conference. Cat made this conference not only happen, but she made it the wonderful experience that it was. Cat, you are amazing. Don’t ever forget that. So, here is my paper (below) which I have decided I would like to share with you all here as soon as possible, in the interest of making sure that the word gets as spread as much as possible. In the world I grew up in, girls were considered an inconvenience on a family. Ugly girls were considered an embarrassment as well as an inconvenience. And ugly, fat girls were considered a punishment. It was believed intellect was wasted on girl children, and considered stolen or unlawful in an ugly, fat girl child, as though she had somehow robbed one of the other children of what was rightfully theirs. I fought for every scrap of my education. It was rarely encouraged, regularly discouraged. My voracious hunger for reading was ridiculed and often blamed for my fatness. Consequently I barely scraped through my senior year of high school, believing the barrage of messages at home and in school that told me that I was worthless because of my fat, female self. I don’t have a string of letters after my name. I have never attended a fine university such as this one. The years that many young people spend working hard to fill their heads with an education, I spent scraping a life up on my own from whatever tools I had at hand – elbow grease, that voracious hunger for reading and a base of kind friends who believed in me all along, even when I didn’t believe in myself. But what I have done, is spent a lifetime in this fat body. I have spent almost 40 years learning exactly what the world thinks of fatness. I have lived in this fat body, loved in it, laughed in it, cried in it and tried to erase it through almost every method available. I have spent most of my 40 years being the one of the fattest bodies in any given room. I am the world’s leading expert on life in this fat body. Yet despite growing media attention on fat bodies, actual fat people are in the minority of the people who get to speak on the topic of fatness. People who have no connection to fatness, either personally or professionally are given forum to express their opinions on fatness. While we have Phil the marketing executive denouncing fat people for being angry and aggressive while not taking responsibility for their bodies, and Ryan the lecturer in politics declaring that fat people are unwilling to “conform to the societal standards of eating” and therefore earn discrimination, we have very few actual fat people who are given space to tell their stories and speak their truths, and when they are, vitriol is poured on them with no support or even acknowledgement of this vitriol from the media that published them. With this growing media attention on weight and health, more and more opportunities arise for grassroots fat activists like myself to collaborate with academics and professionals in these fields. 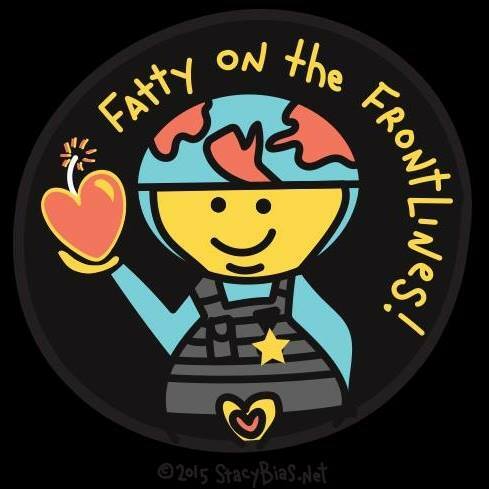 These can be powerful projects that shed positive light on life in a fat body, and can also open up a world of opportunities for fat activists. But there is still a chasm between how academics and professionals in these fields are treated in comparison to how fat people are treated. To start with, it is as if, for any information about life in a fat body to have merit, it must be validated by an academic or professional, preferably a thin one. There is a direct relationship between the amount of power and privilege an academic or professional has and how valid their voice is in the media, regardless of any motive or bias that the academic or professional may have. For fat activists and fat people in general, these topics are deeply personal and often emotionally charged. Our passion for the topics of life in fat bodies are borne of how deeply we carry the societal assumptions about our fatness. When fat people are vilified or dehumanised, it is personal and we are justified in our emotional reaction to the highly toxic messages that are sent to us about our bodies. When our voices are dismissed in favour of academics or professionals with thin privilege, it further stigmatises us as human beings, yet even further damage is done when those academics or professionals dismiss us themselves, ignore their privilege and treat our lives and realities as case studies or mere data. Even when making the same arguments that we fat activists make ourselves, the failure to acknowledge their privilege does harm. It gives agencies like the media unspoken permission to dismiss the voices of fat people as well. It is important for academics and professionals to acknowledge that they are also often in a position of power when working with fat activists. They usually have the decision as to what is published, the ability to choose which media outlets they engage with and resources that grassroots fat activists do not have access to. It is important for academics and professionals to regularly “check in” with fat activists they are working with, to ensure that they are comfortable with the way they are portrayed in the media, that they consent for personal information to be shared at any time and that they have the right to choose what level of engagement they make. After all, this is not just research to us, this is our lives. Our lived experience does not belong to greater academia to investigate, disassemble or pathologise, it belongs to us. We are not whales to be rolled back out to sea. We do not need conservation. Pity is no more welcome to us than disgust. But most importantly, no human being wants to feel discarded, and once the research or project is over, and the academics or professionals move onto their next body of work, they must acknowledge that we fat activists don’t get to hand in the paper and walk away. We must continue on fighting for our right to a life of dignity and respect. We must continue on, living in a body that general society treats as diseased and defective. Collaborations between grassroots fat activists and academics or professionals, when conducted ethically, with clear communication and understanding, can result in powerful changes to the quality of life of not just fat people in general, but the activists themselves, as you can see by these incredible images that have been playing behind me. But academics in positions of power and privilege must be conscious of, and acknowledge that power and privilege. After all, it is not their stories that are being told. They are ours to tell. *Please note, I have limited internet access so any comments (pending or published) will not be answered until I am able to get regular internet access. Very eloquently phrased, Kath. I only wish I could have been there to hear you in person. Wonderful Kath – you are an inspiration. More big fat love from the other hemisphere. Congratulations, this is wonderful! I hope you are so proud! I’m looking forward to reading your report of the conference, too. Oh whoops, I think I have commented as “raindelayed” here in the past…I can’t keep track of my pseudonyms! Hooray from a fat academic in the US!!!! Eloquent, well structured, truthful, honest, inclusive and so very very effective. This is a truly beautiful piece Kath, you have done a great job on it, and I offer my congratulations to you, and hope that you are as proud of yourself, as I am inspired by you! I hope the other presenters at the conference heard your words, as do others here from your blog. I just read this post and am really moved. I will try to post more comment when I have time to digest what I want to say. Wonderful… I just discovered this site from a link in the JWR. While hardly a Clydesdale at 63″, I like the idea of that class of athlete. I resent the statistical tyranny of BMI (invented by a statistician based on French army draftees circa 1880) being imposed on my ability to engage in activities without regard to my overall health. Thank you all for your kind words and support. Most appreciated!